If you’re a holidaymaker, or a frequent flyer - even if you usually travel long distances by car or train some good flight and travel socks are an essential, like our own SockShop 80 Denier Flight and Travel Socks. The built-in compression helps to prevent swelling, stimulate proper blood flow and cut down risk of blood clots, preventing dangerous DVT. 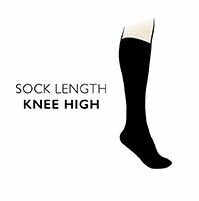 SockShop 80 Denier Flight and Travel Socks are knee length, fine woven and opaque, with a sheen finish, ribbed leg, soft touch feel and most importantly, graduated compression with a factor of 14-18, making them ideal for all forms of extended travel.